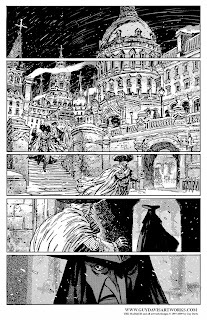 In the first Marquis mini-series "Danse Macabre", I wanted to recap the previous issues in the story itself instead of running a synopsis in the inside front cover. Seemed like a neat idea at the time, but it was a big mistake since when the book was collected this made each chapter redundant with the premise constantly restated in different ways and slowed the story down when read all at once. 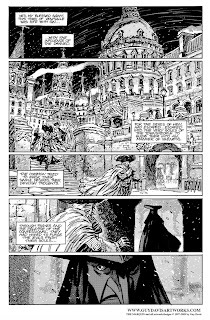 So for the Marquis: Inferno collection I went through and removed some of that text and digitally patched the areas of missing artwork that the lettering covered. Above is the original first page to Danse Macabre #2 and the new version for the Inferno collection that lets the artwork tell the story. very subtle work, you cant tell the difference at all. It is wonderful to see how Marquis pages have a life of their own changing and evolving with time as formats and intent changes. The cool thing about the re-worked page (apart from the fact that it is beautiful) is that without the text it is like a brand new page. It reads different and has a different beat. Thank you for sharing! I really wasn't sure about reworking old material at first, I never liked the idea of going back to change what's already seen print. The artwork itself is pretty much the same, just patching up what was missing under the old lettering (and of course Dave Stewarts new colors for chapter 5). But I think the new book will read a lot smoother as a whole now. The Marquis: Inferno in 3D! The Coachman~ Start to finish! The Marquis and the Coachman! Welcome to the Marquis' Inferno!